The script of the soap opera created by Braziliality to be recorded live in the event with the inetraction of the audinece as characters of the story. The telenovela was broadcasted LIVE in the cafe area. Over 10 members of Braziliality were involved in this playful experience. 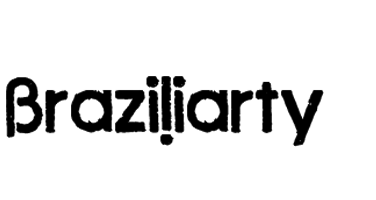 Braziliality team: Alicia Bastos, Bianca Turner, Azul Serra, Nayana Fernandez, Gabriela Dworecki, Camilla Danieletto, Mayra Linares and Giselle Barboza. Many thanks to Michal and Tom Bolton. The Frevo Drop installation was comissioned by the Victoria & Albert Museum for the Late at V&A Hot Brazil event in January of 2012. Alicia Bastos & Bianca Turner created an installation made of 30 original frevo umbrellas, insidivually hand decorated and lit. The idea came to link the London and Brazil throught the iconic umbrellas that are essential accessory in the London winter and the summer in Brazil during the Carnival in the North East of the country. Both season happen simultaneosly and Frevo Drop aimes to bring the warmth and colours of Brazil to the UK. Frevo is a Brazilian style of carnival music and dance distinct to the culture of the north east region of Perambuco. Dancers with frevo bands are known for their energetic moves accompanied with the waving of colourful parasols. During the 19th century, fierce competition between frevo bands could see fights breaking out between their supporters in the watching crowd and bands had to resort to hiring protection. The Brazilian martial art capoeira was illegal on the streets so fighters would cover up their moves as dance and used the seemingly harmless props of umbrellas as weapons to avoid arrest, with today’s frevo costumes and parasols still inspired by traditional folk styles. The installation was seen in the main foyer of the V&A for the most successful Late to date event in the museum.